This brief guide presents a set of good data management practices that researchers can adopt, regardless of their data management skills and levels of expertise. Ce petit guide présente un ensemble de bonnes pratiques que les chercheurs peuvent adopter, et ce, indépendamment de leurs compétences ou de leur niveau d’expertise. A data dictionary is critical to making your research more reproducible because it allows others to understand your data. The purpose of a data dictionary is to explain what all the variable names and values in your spreadsheet really mean. This guide gives examples and instruction on how to asemble a data dictionary. The overall description for your project could be referred to as project metadata, citation metadata, a data record, a metadata record, or a dataset record. The information supplied in the project description should be sufficient to enable you and others to find and properly cite your data. A metadata record gives the basic who, what, where, and when of the data. It is a high level description that others can use to cite your data. It may be submitted with a dataset as a separate file when deposited in a repository, or displayed in the repository with data entered into a form. Metacat is a repository for data and metadata (documentation about data) that helps scientists find, understand and effectively use data sets they manage or that have been created by others. Thousands of data sets are currently documented in a standardized way and stored in Metacat systems, providing the scientific community with a broad range of science data that–because the data are well and consistently described–can be easily searched, compared, merged, or used in other ways. This video is a complete rundown of the basics in QGIS, a free GIS software package designed as an alternative to ArcMap. A training manual written by the QGIS Development Team. It includes instruction on the basic use of the QGIS interface, applied applications, and other basic operations. Topics include: general tools, QGIS GUI, working with projections, raster and vector data, managing data sources and integration with GRASS GIS. Examples are given of working with GPS and OGC data. A list of plugins is also included. Lessons learned from various USBR data management efforts. This training webinar for Python is part of a technical webinar series created by the USGS Core Science Analytics, Synthesis, and Library section to improve data managers’ and scientists' skills with using Python in order to perform basic data management tasks. Who: These training events are intended for a wide array of users, ranging from those with little or no experience with Python to others who may be familiar with the language but are interested in learning techniques for automating file manipulation, batch generation of metadata, and other data management related tasks. Requirements: This series will be taught using Jupyter notebook and the Python bundle that ships with the new USGS Metadata Wizard 2.x tool. Why should you worry about good data management practices? This page provides an overview of data management planning and preparation. It offers practical methods to successfully share and archive your data at the ORNL DAAC. Topics include: Best Practices for Data Management, Writing Data Management Plans including examples of data management plans, How-to's amd Resources. Workshops and tutorials are available as recordings, slides, and exercises on topics such as: Data Literacy for Postdocs, Increasing Openness and Reproducibility using the OSF, and Research Data Life Cycle. This lesson assumes no prior experience with the tools covered in the workshop. However, learners are expected to have some familiarity with biological concepts, including nucleotide abbreviations and the concept of genomic variation within a population. Learn how to work with Amazon AWS cloud computing and how to transfer data between your local computer and cloud resources. This webinar series explores each of the four FAIR principles (Findable, Accessible, Interoperable, Reusable) in depth - practical case studies from a range of disciplines, Australian and international perspectives, and resources to support the uptake of FAIR principles. 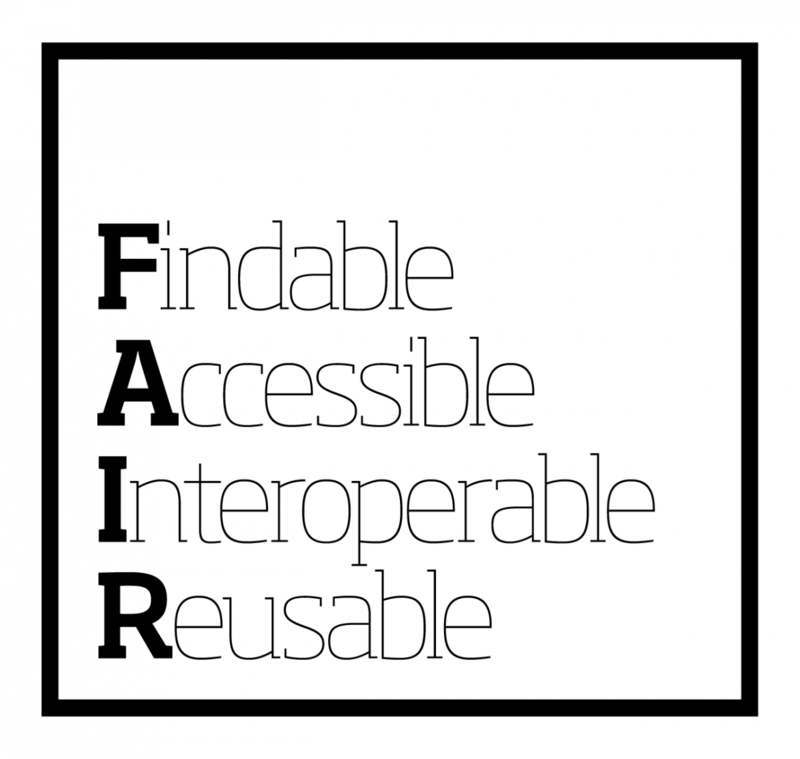 The FAIR data principles were drafted by the FORCE11 group in 2015. The principles have since received worldwide recognition as a useful framework for thinking about sharing data in a way that will enable maximum use and reuse. A seminal article describing the FAIR principles can also be found at: https://www.nature.com/articles/sdata201618. A presentation on FAIR Data and Software, and FAIR Principles and Managment Plans, which occured during a Carpentries-Based Workshop in Hannover, Germany, Jul 9-13 2018. Research data tend to change over time (get expanded, corrected, cleaned, etc.). Version control is the management of changes to data or documents. This talk addresses why version control is a crucial component of research data management and introduces software tools that are available for this purpose. ​This workshop was part of the Conference Connecting Data for Research held at VU University in Amsterdam. Essentials 4 Data Support is a product of Research Data Netherlands. Federal funding agencies are increasingly recommending or requiring formal data management plans with all grant applications. To help researchers meet those requirements, ICPSR offers these guidelines. Based on our Data Management Plan Web site, this document contains a framework, example data management plans, links to other resources, and a bibliography of related publications. ICPSR also hosts a blog on data management plans. We hope you find this information helpful as you craft a data management plan. Please contact us at netmail@icpsr.umich.edu with any comments or suggestions. A collection of online data management guides, data management planning tools, guidelines from funding agencies, and data management plan examples for researchers and librarians. This page also contains a link to various courses and tutorials on research data management for health science librarians and researchers at: https://nnlm.gov/data/courses-and-workshops . The ReaDI Program has created several tutorials and templates to aid in the management of data during the collection phase of research and preparing for publication. Tutorial topics include: Good Laboratory Notebook Practices, Laboratory Notebook Checklist, Best Practices for Data Management When Using Instrumentation, and Guidelines on the Organization of Samples in a Laboratory. Downloadable templates are available on related topics, such as data to figure map templates. The Research and Data Integrity (ReaDI) program is designed to enhance data management and research integrity at Columbia University. The ReaDI program provides resources, outreach and consultation services to researchers at all stages in their careers. Many of the resources are applicable to researchers at any institution. - Software sustainability, preservation and sharing. The guidelines available from this web page cover a number of topics related to research data management. The guidelinesare targeted to researchers wishing to submit data to the Finnish Social Science Data Archive, but may be helpful to other social scientists interested in practices related to research data management with the understanding that the guidelines refer to the situation in Finland, and may not be applicable in other countries due to differences in legislation and research infrastructure. The guidelines are also available in FSD's Guidelines in DMPTuuli, a data management planning tool for Finnish research organisations. It provides templates and guidance for making a data management plan (DMP). The resources in this section will help you understand how to develop your DMP. The checklist outlines the minimum USGS requirements. The FAQ and DMP Writing Best Practices list below will help you understand other important considerations when developing your own DMP. To help standardize or provide guidance on DMPs, a science center or funding source may choose to document their own Data Management strategy. A number of templates and examples are provided. This page also includes resources related to the overall research data lifecycle that will help put data management plans in the context of the research done. Information is provided that identifies what the U.S. Geological Survey Manual requires. Looking after digital data is central to good research. We all know of horror stories of people losing or deleting their entire dissertation just weeks prior to a deadline! But even before this happens, good practice in looking after research data from the beginning to the end of a project makes work and life a lot less stressful. Defined in the widest sense, digital data includes all files created or manipulated on a computer (text, images, spreadsheets, databases, etc). With publishing and archiving of research increasingly online we all have a responsibility to ensure the long-term preservation of archaeological data, while at same time being aware of issues of sensitive data, intellectual property rights, open access, and freedom of information. The DataTrain teaching materials have been designed to familiarise post-graduate students in good practice in looking after their research data. A central tenet is the importance of thinking about this in conjunction with the projected outputs and publication of research projects. The eight presentations, followed by group discussion and written exercises, follow the lifecycle of digital data from pre-project planning, data creation, data management, publication, long-term preservation and lastly to issues of the re-use of digital data. At the same time the course follows the career path of researchers from post-graduate research students, through post-doctoral research projects, to larger collaborative and inter-disciplinary projects. The teaching material is targeted at co-ordinators of Core Research Skills courses for first year post-graduate research students in archaeology. The material is open access and you are invited to re-use and amend the content as best suits the requirements of your university department. The complete course is designed to run either as a four hour half-day workshop, or 2 x 2 hour classes. Alternatively, individual modules can be slotted into existing data management and core research skills teaching. Research papers and data products are key outcomes of the science enterprise. Governmental, nongovernmental, and private foundation sponsors of research are increasingly recognizing the value of research data. As a result, most funders now require that sufficiently detailed data management plans be submitted as part of a research proposal. A data management plan (DMP) is a document that describes how you will treat your data during a project and what happens with the data after the project ends. Such plans typically cover all or portions of the data life cycle—from data discovery, collection, and organization (e.g., spreadsheets, databases), through quality assurance/quality control, documentation (e.g., data types, laboratory methods) and use of the data, to data preservation and sharing with others (e.g., data policies and dissemination approaches). The article also includes a downloadable image that illustrates the relationship between hypothetical research and data life cycles and highlights the links to the rules presented in this paper. - Other University of Iowa services and resources available as well as external tools, websites, and repositories that may be useful. Presentation given by Esther Plomp at the "FAIR Data - the Key to Sustainable Research" seminar at Tartu University Library on the 9th of April 2019. Data Champions are experts in data management who share their experience with their group/department members. They are volunteers that act as advocates for good data management and sharing practises and they help their Faculty’s Data Steward with disciplinary specific understandings of Research Data Management (RDM). The Data Champion programme started in September 2018 at the TU Delft and is open to researchers from all levels (PhD students to professors) as well as support staff (data managers, software developers and technicians). As the Data Champions are members of all faculties and various departments of Delft University of Technology (TU Delft) they form a network across the university campus. The Champions are invited for meetings where they interact with each other and share their experiences, such as achievements and problems that they encounter in managing data and software. They are also encouraged to participate at a national and international level by being informed on current trends in data management and there is a travel grant available that allows them to participate in RDM events, trainings and workshops. At TU Delft they are actively working together with the Data Stewards on RDM policy development as well as involved in more practical activities such as coding support and Software Carpentry workshops. These activities increase the visibility and impact of the Data Champions, recognise their data management efforts, and offer them opportunities to learn new skills which they can share with their local community members. This course provides an introduction to photgrammetry with a full set of data to utilize in building a Digital Elevation Model using Agisoft Photoscan. The course uses a gitHub repository to grow the workshop into a full featured course on the applications of modern remote sensing and photogrammetry techniques in and for the environmental and geosciences. The processing and analysis of natural languages is a core requirement for extracting structured information from spoken, signed, or written language and for feeding that information into systems or processes that generate insights from, or responses to provided language data. As languages that are naturally evolved and not designed for a specific purpose natural languages pose significant challenges when developing automated systems. This workshop provides an introduction to reproducibility and communication of research using notebooks based on RStudio and Jupyter Notebooks. The development of effective documentation and accesible and reusable methods in scientific analysis can make a significant contribution to the reproducibility and understanding of a research activity. The integration of executable code with blocks of narrative content within notebook systems such as those provided in RStudio and the Jupyter Notebook (and Lab) software environments provides a streamined way to bring these minimum components (data, metadata, code, and software) into a package that can be easily shared with others for review and reuse. A high-level introduction to the notebook interfaces provided for R and Python through the RStudio and Jupyter Notebook environments. From the master page for this resource, the Reproducibility and Communication Using Notebooks ipynb file provides more information about what is covered in this workshop. In previous sessions we have looked at use cases for relational database management systems (RDBMS), which predominantly make use of SQL. Today's session provides an overview of NoSQL databases. NoSQL can be understood to mean "no SQL" or, alternatively, "not only SQL." NoSQL databases are non-relational, which in the simplest terms means they are not made up of tables. This is a tutorial about version control, also known as revision control, a method for tracking changes to files and folders within a source code tree, project, or any complex set of files or documents. Learn advanced version control practices for tracking changes to files and folders within a source code tree, project, or any complex set of files or documents. Pandoc (http://pandoc.org) is a document processing program that runs on multiple operating systems (Mac, Windows, Linux) and can read and write a wide variety of file formats. In many respects, Pandoc can be thought of as a universal translator for documents. This workshop focuses on a subset of input and output document types, just scratching the surface of the transformations made possible by Pandoc. How to motivate researcher engagement? Presentation given about Data Stewardship at TU Delft and Data Championship at Cambridge University at Dutch LCRDM (Landelijk Coördinatiepunt Research Data Management) Data Steward meeting 1st December 2017. Topics covered include suggestions by data stewards about how to approach and persuade researchers to engage in data management and stewardship activities. This free online course aims to strengthen the capacity of data producers and data consumers to manage and use open data in agriculture and nutrition. One of the main learning objectives is for the course to be used widely within agricultural and nutrition knowledge networks, in different institutions. The course also aims to raise awareness of different types of data formats and uses, and to highlight how important it is for data to be reliable, accessible and transparent.